He complained about the press staying "silent" on an issue they covered obsessively. Trump spent some of the morning's Twitter time congratulating Debbie Lesko on her win in the special election to replace Arizona Rep. Trent Franks. Lesko won by a margin of 5% over the Democratic challenger, in a district that elected Franks to nine consecutive terms, mostly by landslide margins. Trump himself carried the district by 21% in the 2016 election. In the tweet, Trump called Lesko's 5% margin a "big win" and complained that the "press is so silent." In fact, the race was the biggest domestic political news of the day, covered by every national news organization. 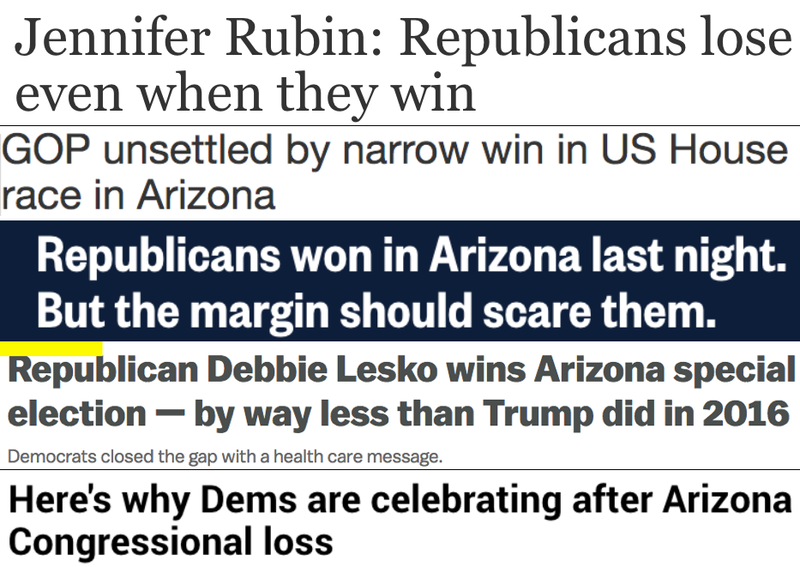 What Trump appears to mean by his reference to "silence" is the number of people who are interpreting the narrow victory in a deep-red district as good news. Most of the special elections for Congress have happened in strongly Republican districts, and Trump's historically low popularity has made those races an average of 17 points closer than they otherwise would be. Trump's analysis of the election as a "big win" is inaccurate, but it may not be his fault: his aides routinely shield him from seeing bad or unflattering news, and it is possible he simply hasn't been told about the erosion of Republican support. Presidents don't get to demand that the media cover things just the way they want.